Regardless of your experience with real estate investing, we’re 110% confident you’ll come away from Millionaire Jump Start™ with the confidence and knowledge you need to make money buying, selling, and investing in real estate. Space is limited so sign up for our next event today!!! This three day course is designed to take you through the real estate investing life cycle one step at a time and show exactly how to get started in buying and selling real estate. Frankly, we don’t care what your level of experience is with real estate investing. We’ll show you the Street Smart® method for maximizing profits from your investment holdings. Don’t you deserve VIP status? VIP Elite status is limited. 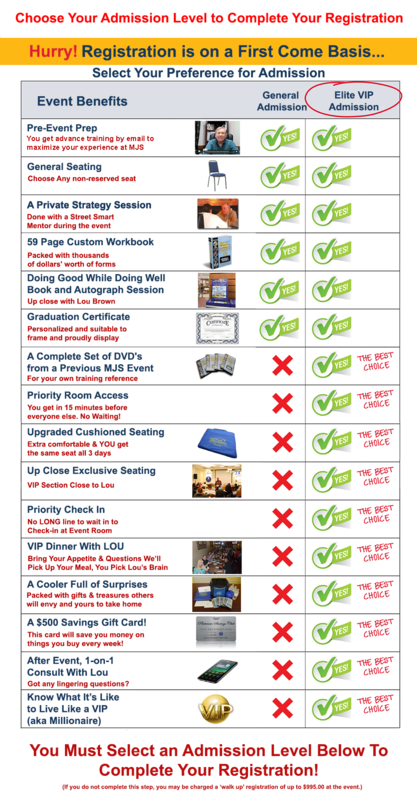 Register now before the VIP seats are gone!